Vancouver, BC, April 19, 2017 – Doubletree by Hilton™ Hotel and Conference Centre Regina has won the 2016 Housekeeping Award of Excellence, beating out more than 300 hotels in the Americas for the honour. The award, issued by Hilton Inc., is in the category of hotels with 225 rooms or more in North, Central and South America. 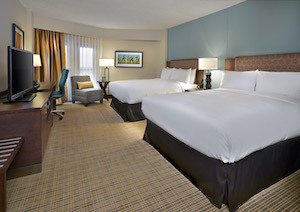 Hotels are scored on quality assurance audits measuring cleanliness in guest rooms and suites.